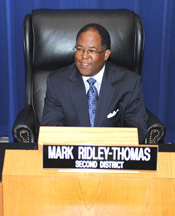 In 2008, Mark Ridley-Thomas was elected the first Black man to become a member of the Los Angeles County Board of Supervisors, as Supervisor of the Second District. On Friday, November 30, at 10 a.m., he will make history when he is sworn in as the first African-American man to hold the position of board chairman. The ceremony will include highlights of Ridley-Thomas’ first term in office, such as the completion of the new Martin Luther King, Jr. Center for Public Health, more than $5.7 billion of existing or planned investments in new libraries, community centers, parks, community gardens, medical and transportation infrastructure, as well as tens of thousands of jobs created thanks to his advocacy on local worker hiring policies for major county transportation and construction projects. The event also will note upcoming developments such as the construction of the new Crenshaw-to-LAX light rail line, the Martin Luther King, Jr. Community Hospital and other Second District projects. Renata Simril, Senior Vice President of External Affairs for the Los Angeles Dodgers will be the Mistress of Ceremonies, and Dr. Robert Ross, President and CEO of the California Endowment, will officiate. Inner City Youth Orchestra, the trio Sweet Harmony, and the Latin band sensation, Hot Peppers will perform, and about 500 people are expected to attend. Ridley Thomas has already started on one of his future agenda items. Last Tuesday, the board unanimously approved his motion on a Framework for Funding Affordable Housing and Economic Development. His focus will be to target redevelopment funds for disadvantaged communities severely impacted by Governor Jerry Brown’s discontinuance of Community Redevelopment Agency departments statewide. “The work that redevelopment agencies were initially set up to do - mitigate blight, promote economic development and establish affordable housing - is far from over,” he said. During his first term in the Second District, Ridley-Thomas’s highest priority was re-opening the Martin Luther King Jr. hospital for his constituents, a goal he has already reached. “In a couple of weeks I will mark my first anniversary on the Board and I am pleased that I was able to make the announcement of the re-opening of MLK Hospital,” he said in a speech during that time. Now, besides the CRA issue, the new chairman said he has a list of other issues to tackle. For instance, as one who is always in the community among his constituents, Ridley- Thomas said he is keenly aware of the Crenshaw and surrounding community’s concern about the Leimert Park Village stop along the Crenshaw LAX line, scheduled to begin in the near future. To that end, he requested a funding study to examine ways to pay for the stop, and moving an 11-block section of the rail line along Crenshaw Boulevard below ground, within the existing cost estimate. Furthermore, the Supervisor’s vision is that the long-term investments regarding the stop at Leimert Park Village would greatly enhance the area as a cultural destination, and the underground Park Mesa Heights tunnel would speed travel times for passengers on the Crenshaw/LAX line. Then there was a serious health problem caused by soil contamination in a residential apartment complex called Ujima Village – which the Supervisor inherited. When the matter came to his attention, he went after Exxon-Mobil, the responsible party, and publicly stated that they must also be held accountable for cleaning up the contaminated land, and making the community whole since they are responsible for causing the contamination. Back then, he emphasized that an investigation is currently being conducted by the Los Angeles Regional Board to determine the extent of the contamination. “As of August 2010, all of the residents from Ujima Village had been relocated. In 2009, I effectively urged the Housing Authority to cease eviction efforts, and I personally met with all of the remaining residents in Ujima Village to make sure that they were receiving proper relocation support,” he said during an earlier interview. Ridley Thomas has also taken on redistricting: the re-shaping of the county electoral districts in accordance with the ten-year census, the Voting Rights Act of 1965 and the demographic shifts. After the new boundaries were re-drawn and misunderstandings arose, he explained the process to the public. “When re-drawing the boundaries of the county, we have a constitutional obligation to follow the law, including and specifically the Voting Rights Act of 1965,” he said. Many of the community’s leaders chimed in on the historic significance of Supervisor Ridley-Thomas’ ascension to the role of Chairman of the Board of Supervisors. I will look forward to the Supervisor's tenure as Pres of the Board---he made history by being the first AA male Supervisor and I have no doubt the leadership he will provide in the region will also be history making. Supervisor Ridley-Thomas' colleagues have chosen him to be Chairman because he's a wise leader who can bring people together. As President of the Los Angeles City Council, I'm looking forward to continuing our many collaborations on behalf of the people of our community. It’s a historic moment … I think the greatest honor is to be recognized by your colleagues and to be selected for your leadership skills and abilities … and Mark Ridley-Thomas has been a leader, not only on the Board but also in our community. Mark Ridley-Thomas was one of those individuals who was a quick study; he took in every change in the political arena and he worked with me to get elected. He was very, very bright. Mark is a product of our community’s efforts of good government.